One of these days I’m going to write a blog about my favorite locations to photograph Colorado wildflowers amid sweeping landscapes. (Visit my Colorado Wildflowers Gallery for more images).On that list would be a little known area (except to locals) close to Berthoud Pass called Butler Gulch. In the summer of 2014 the colors were the best I’d seen – and I’d visited the iconic Colorado locations like American Basin near Lake City and Yankee Boy Basin near Ouray. I imagine the landscapes near Crested Butte were excellent this summer, but I hit that location a bit early. Butler Gulch is located on Highway 40 past the town of Berthoud Falls. The turnoff is at the first switchback just before you start the climb up Berthoud Pass. Turn left before the first switchback. You’ll follow the road past the Big Bend picnic area a few miles before eventually turning onto an easy dirt road (you’ll have to turn right because you’ll encounter a gate – if you go straight that is restricted access – I think it is a mine). After another mile or so the road will split with the right branch heading uphill. Go left and you will reach a parking area in ~100 yards. Park, walk past by the gate on an old jeep road, and start hiking as the road makes a sweeping left curve before starting a gradual ascent. The trail to the best meadows for wildflowers is just over two miles and about 1000 vertical feet . There are parts of this hike that become a grunt but nothing too bad. The most treacherous portions of this hike are a few water crossings that require short traverses over trees laid across the water. Even these parts are not too difficult, but crossing them in the dark can be a bit sketchy (I usually have to do this because I head up there for sunrise.) Last year I did take a misstep and went down to my knee in a very cold stream. That made for a long morning. Wildflowers fill the meadow in this panorama image from Butler Gulch near Berthoud Falls, Colorado. Eventually you’ll come to a large cascade before heading left and making a few semi-switchbacks. This portion of the trail will shoot you out at a clearing that is the upper portion of the gulch. Continue here for a few hundred yards and off to your left you’ll find the flowers. You can continue on to some old mine ruins or even hike up to the ridge. But if you’ve come for Colorado wildflowers, here you’ll find daisies, various colors of paintbrush, elephants, and even columbine on the rocky outcrops to your left. Walk over to the stream 50 yards or so to your right for some images of flowing snow-fed waters lined with pink and red flowers. 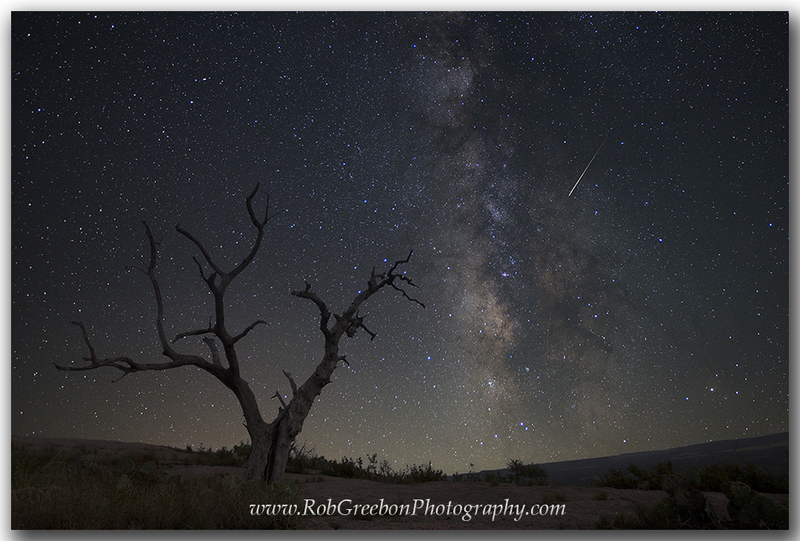 If you arrive really early – like about 4am – you can even photograph the Milky Way rising over the ridge. 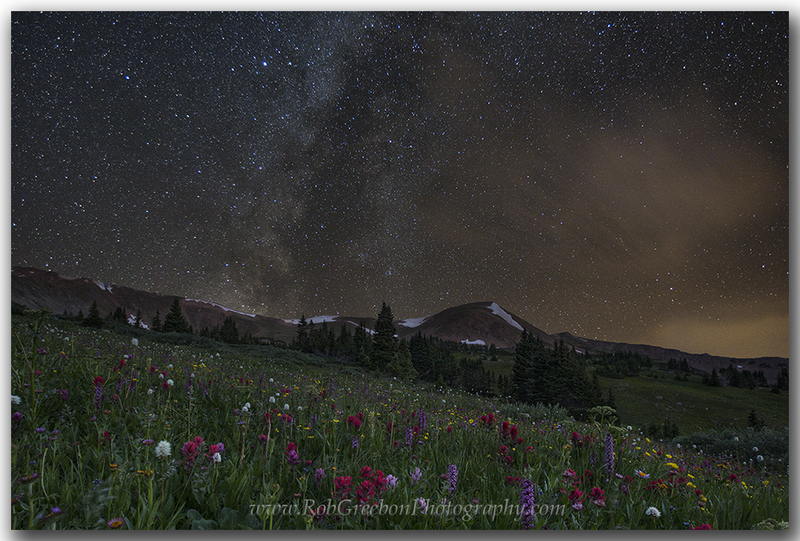 The Milky Way rises over Colorado Wildflowers in a little-known basin called Bulter Gulch. 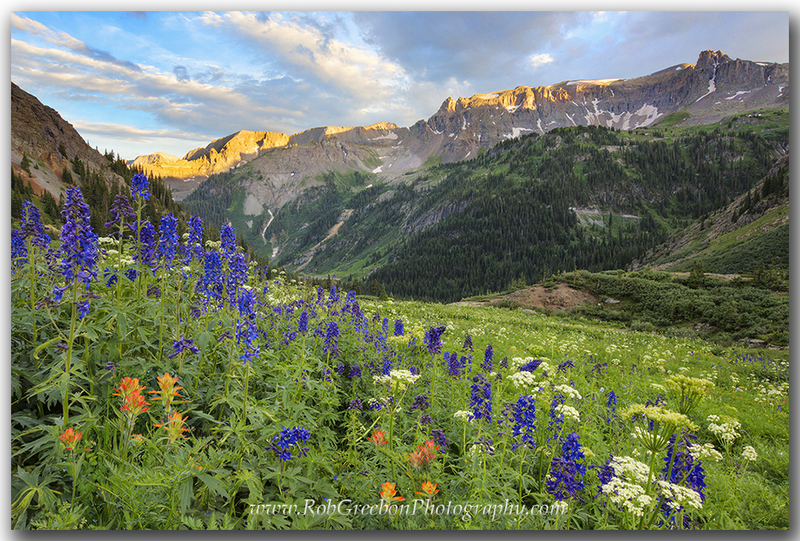 Butler Gulch is one of my favorite Colorado locations for wildflowers and landscapes. I make the trek up here several times each summer. Many folks use this trail, so go early because parking can be limited. If you get up there before sunrise, you’ll have the place to yourself unless I’m up there! Having to spend 6 weeks in the Rocky Mountains is a tough job, but I suppose someone has to do it. 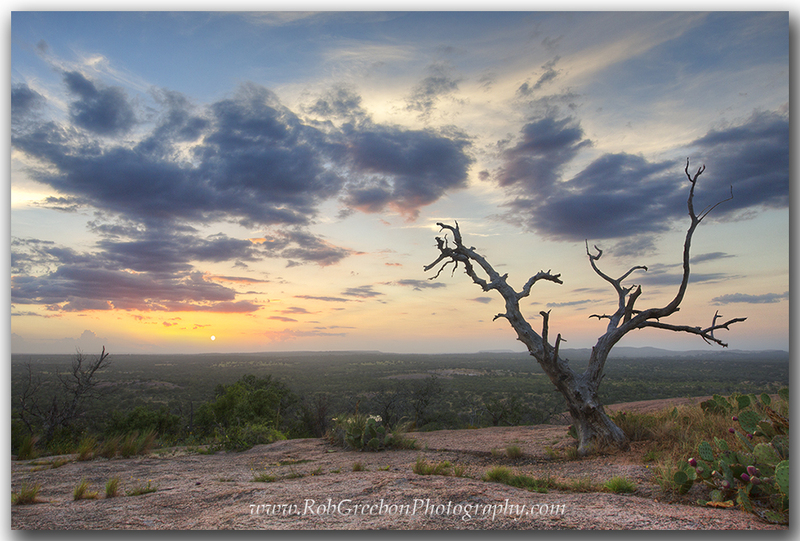 Alas, this is my job – photographing Colorado landscapes and Austin, Texas, skylines, as well as other Texas locations. In late July, wildflowers begin to burst forth in the basins and gulches of Colorado’s high country. When the timing is right, one of the areas I try to visit is Yankee Boy Basin near Ouray, located in the Uncompahgre National Forest. The dirt road leading to Yankee Boy isn’t too bad for the first 6 miles. Most passenger cars can do it. Along the way you’ll pass by an old mine and the much photographed Twin Falls. After that, however, the road turns considerably worse. I’m willing to take my 4WD SUV another 2 miles, but no further. You can take a high clearance 4WD higher, but I’m happy reaching the 8 mile point. This area provides colorful Colorado wildflowers, including columbine, paintbrush, daisies and bluebells, against a landscape punctuated by one of Colorado’s 14,000 foot peaks, Mount Sneffels. In the evening you can shoot towards Sneffels and, if the conditions are right, you’ll have a great sunset as well. The most recent evening I was there I arrived about 6:30pm after bumping my way up the last two miles. As soon as I got out of my car, the rains came. After a few minutes, as usually happens at 12,000 feet, the air quickly cleared and gave way to a beautiful evening. I spent the next few hours enjoying the scenery and practicing my craft. The wildflowers of Yankee Boy Basin near Ouray, Colroado, can put on quite a show in July and August. Yankee Boy Basin is actually private land and made public by the generosity of its owners. The wildflowers tend to peak the third and fourth weeks of July. If your are adventurous and physically fit, you can also hike Mount Sneffels. Alternatively, the hike from Yankee Boy Basin over Blue Lakes Pass and down to the second and first Blue Lakes is also breathtaking. On the other side of the ridge, especially looking down on the turquoise waters of the Lower Blue Lake you’ll find a slope filled with wildflowers in mid summer. I’ve done this hike and, while tired at the end, I thoroughly enjoyed the vistas and landscapes and most of all the colorful flowers of the area. If I can answer any questions about this area, just let me know. In the meantime, feel free to visit my Colorado Gallery. Also, keep up with my photography on my Professional Facebook page.